On Sat., Mar. 29, 2014, the anniversary of the 1987 Haitian Constitution, tens of thousands of people took to the streets of the capital, Port-au-Prince, and Haiti’s second largest city, Cap-Haïtien, to demand the unconditional departure of President Michel Joseph Martelly, despite a strange reticence from the Lavalas Family party’s Executive Committee. The Lavalas Family put out the original call for a march to commemorate the Constitution with the ambiguous slogan: “Mobilization or death,” and then called for Prime Minister Lamothe’s departure, but not Martelly’s, in a statement issued after the demonstration. Meanwhile, in Cap-Haïtien, the initiative to demonstrate for Martelly’s departure was taken by the Movement for the Liberation of Haiti, a popular organization supported by another opposition current, the Patriotic Movement of the Democratic Opposition (MOPOD). The new party, the Dessalines Coordination (KOD), for its part, in a Mar. 27 press conference at the International Lawyers Office (BAI), announced that it would also participate in the Port-au-Prince mobilization. In Port-au-Prince, protesters gathered at two different points: the Church of Perpetual Help in Belair and St. Jean Bosco Church in La Saline. At about 10 a.m., the protesters gathered outside the Church of Perpetual Help marched down the hill towards St. Jean Bosco, where they arrived around 10:30 a.m., creating a huge crowd in the city center. 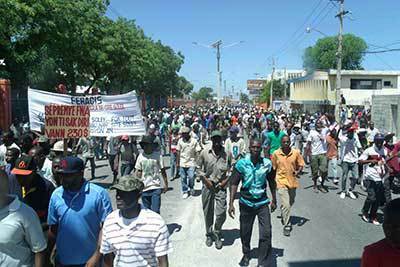 The protesters, mostly from the grassroots organizations, marched peacefully but noisily down several streets accompanied by riot police of the National Police of Haiti (PNH). These slogans showed the large political divide between the Lavalas Family’s Executive Committee and the Lavalas grassroots organizations which have historically made up the party’s base. Demonstrators also pointed to former U.S. President Bill Clinton, his wife Hillary, and current U.S. President Barack Obama as all having conspired against Haiti. They placed a “mental slave” like Michel Joseph Martelly at the head of the first black republic to keep the country under their control and that of so-called leaders in their service. The failure of the Martelly/Lamothe regime is also their failure, demonstrators said. Dr. Maryse Narcisse, the coordinator of the Executive Committee of the Lavalas Family Political Organization, has called for the departure of Lamothe and his ministers, but, it must be emphasized, she did not call for Martelly’s departure. The party’s statement said: “Lamothe must go. He symbolizes corruption, waste of national resources, poverty, unemployment, insecurity, impunity, lying, and kidnapping.” This focus soley on Lamothe’s departure is also the position of Deputy Arnel Belizaire Delmas, a leader of FOPARC (Patriotic Front for Respect of the Constitution), which only helps, objectively, to strengthen the Martelly/Duvalier camp. The position of the Lavalas Family leadership and Deputy Bélizaire reflects nothing more than an internal contradiction between two factions within the Martelly regime: the Duvalierist wing, represented by the Mayard-Paul brothers, Gregory and Thierry, and the pocket-patriot bourgeoisie represented by Lamothe. This position to give Martelly a pass while demanding Lamothe’s resignation reflects the sad fact that the Executive Committee of the Lavalas Family party is now dominated by politicians from the two wings of the ruling class, the bourgeoisie and the big-landowners, many of whom ironically supported the two coups, in 1991 and 2004, against former President Jean-Bertrand Aristide. Despite these differences, Mar. 29 was the first large demonstration uniting all of the anti-Martelly opposition currents since last year. “If [the march on the U.S. Embassy] of Nov. 29 2013 divided us, we are please to say that the demonstration of Mar. 29, 2014 has again united all of us against the regime” said Rony Thimoté, a spokesman for FOPARC, which is a somewhat renegade base organization of the Lavalas Family party. It is clear that this unity among the people must be strengthened and consolidated to maintain a general mobilization against the regime. Many prominent political figures representing different political currents also joined in the Mar. 29 demonstration: Senator Moïse Jean Charles, Deputy Arnel Bélizaire, former Senator Turneb Delpé, former Deputy Serge Jean-Louis, and former Minister of Women’s Affairs and Rights Marjorie Michel. The demonstration ended without the usual police repression such as the firing of tear-gas at protestors. However, a serious incident occurred at the march’s final rally on Champ-de-Mars’ Constitution Square, where Sen. Moïse Jean-Charles was physically accosted by two Lavalas Family second-tier leaders, Duclos Bénissoit and Dounnaxient “Engineer” Bastien. Mr. Bastien, ironically, is a former member of the Mobilization for the Progress of Haiti (MPH), a party headed by Samir Georges Mourra, a right-wing bourgeois leader of both the 1991 and 2004 coups. Today Mr. Bastien has ostensibly converted himself into a henchman for the Lavalas Family party. Mar. 29 was not the first time he has acted as a provocateur and agent of destabilization. On Sep. 29, 2013, he attempted to disrupt a KOD-sponsored “Popular Forum” which was working out how to arrive at a provisional government to replace Martelly. He also, along with Duclos Bénissoit and former Sen. Gérard Gilles, assaulted Sen. Moïse Jean-Charles at the studios of Radio Zenith earlier in March. He is a classic example of someone who says he is defending the people but who, in reality, objectively or knowingly, is working on behalf of the people’s enemies. Nonetheless, such stunts only reveal those working against the people and do little to derail the growing mobilization. On the contrary, the masses appear to be gaining strength in their struggle for their two key demands: Martelly must go! MINUSTAH must go!